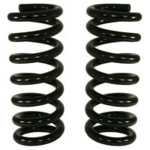 SuperCoils are a heavy duty replacement coil spring for selected trucks and vans as well as a maintenance-free lift option for some of these vehicles. Whether it’s a snow plow, replacement heavy duty bumper, winch, armor plating or simply an over-worked, sagging front or rear end; SuperCoils will remedy the cause of your sag with applications for most Ford, General Motors and Ram trucks and vans. They are also manufactured to provide additional load support for the rear of the popular Ram 1500 and 2500 pickup trucks.